This is a picture taken during on the day of Heroes in Haiti or January 2, 2015. 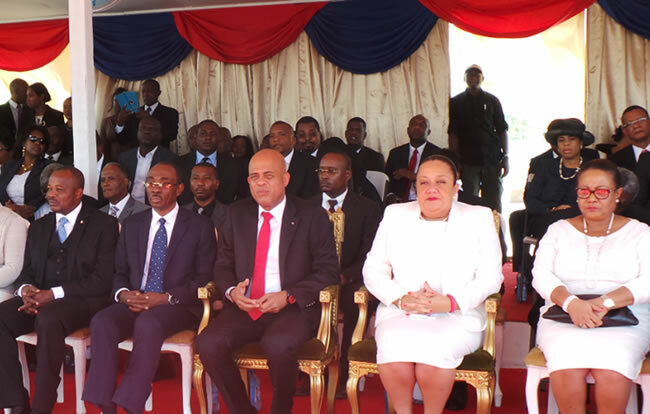 Some of the people in this picture include President Michel Martelly, acting Prime minister, Dr. Florence Duperval Guillaume and current Prime Minister designated, Evans Paul, aka K-Plim. Haiti celebrates its National Independence Day on January 1st. This year marks the 211th anniversary of Haiti's liberation as the first black-led republic in the world. Christopher Columbus first discovered Haiti and conferred the name Hispaniola on the entire island, which included the Dominican Republic on the eastern portion and Haiti the western. Later French colonists renamed Ayiti, Haiti.